I don’t post a lot of meat recipes on this blog. I’m not sure why. I do eat meat. Somehow it doesn’t stimulate my memory, senses, and creative juices as vegetables, breads, desserts, and appetizers do, however. Today I’m popping a quick meat recipe on anyway. Whenever I see a flank steak at the meat counter of Avery’s General Store I’m tempted to make this truly easy dish. 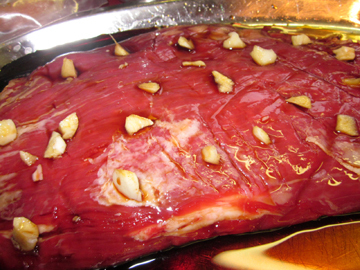 I love marinating things, and flank steak really rewards you with flavor and texture if you marinate it. I’m sorry that the measurements aren’t exact. Luckily, you can’t really go wrong with the recipe. Next time I make it I’ll try to get something written down. But this is just one of those weeks! Lots of phone calls to make and answer, lots of recipes to test and write up, a number of songs to practice, and a bored elderly mother to entertain. Earlier today in her infatuation with the autumn sun Jan made an unauthorized break from the house with her walker. I thought she was napping until the Hawley, Massachusetts, road crew showed up at the door. “Your mother seems to be hiking to Charlemont,” Wayne Clark told me in his laconic drawl. When I found my mother she was WAY down the street chatting unrepentantly with a man she had found while walking. “I knew you’d find me,” she said with a big grin on her face. I had to grin back as I thanked the man and the road crew. Thank goodness for small towns! It takes a village to care for more than just children……. With a small sharp knife make small slits all over one side of your flank steak. Insert pieces of garlic into each slit. 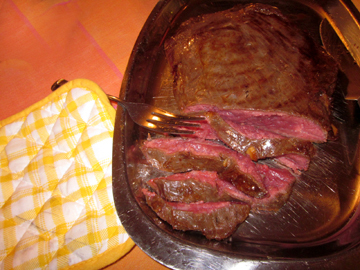 Pour soy sauce onto the steak; then turn it over and repeat the cutting, inserting, and pouring on that side as well. Allow the steak to marinate at room temperature for at least 1-1/2 hours (a little longer is best, but if you want to marinate it for several hours you’ll need to refrigerate it). Turn it every 1/2 hour or so to make sure both sides stay moist. Slice the warm steak against the grain. This entry was posted on Tuesday, October 19th, 2010 at 6:11 pm	and is filed under Meat and Poultry, My Family. You can follow any responses to this entry through the RSS 2.0 feed. You can leave a response, or trackback from your own site. I love it. Hurray for Jan, and I agree about the lack of stray men. But she found one. She’s our heroine. I love rare meat too. Best rare steak and prime rib–Montana; best big, fat rare burger–Texas. Maybe you should have an essay contest about “my best hunk of meat,” juices running down the chin and all. It might bring in the stray men. Oh Tinky, how you manage to mix a flank steak recipe with a run away mother is brilliant and magical. I was piling up tomato steaks in the shed and for some reason thought about Jan and whether she would even know who Clooney, Depp, or Downey are. I’d add a few to them, including Russell Crowe and Clive Owen, for myself, but who would float Jan’s boat? I’m guessing maybe Clark Gable, Douglas Fairbanks, Humphrey Bogart, Errol Flynn, Cary Grant, Jimmy Stewart, or Spencer Tracy. Then I began picturing her meeting up with these stars on Middle Rd. That would be tomato “stakes” not steaks. I was probably looking at Tinky’s steak when I wrote that, and had less than one cup of coffee in me. I realize I am guilty of age discrimination. I failed to mention the stars I adored in the 50s and 60s. They got older, sure, but haven’t we all. So let’s hear it for Marlon Brando, James Dean, Robert Redford, Paul Newman, Sean Connery. If only we could all age like Sean Connery. I love all three lists and will now be looking for movie stars up and down the road as I perambulate with Jan and Truffle. I’d like to add a few of my own, from wildly different eras–Rudolph Valentino, Walter Pigeon, Henry Fonda, Tom Selleck, and Colin Firth. I’m stopping now, but I could go on FOR A VERY LONG TIME! I live in a small town too, and I can completely relate to your story! Although, I really wish we had a General Store here, I could spend hours in one-I love them so! This steak sounds great, I love flank steak and especially love your un-exact measurements..since I never use them anyway! Thanks! Thanks for understanding, EveryDay. I hope you get a General Store someday. Aside from the fact that they sell just about anything one could possibly need, they’re great for people who care for little kids and /or old ladies. I’ve been known to lose my mother and my little nephew in big stores. At Avery’s they are always visible–and they’re always treated like royalty!